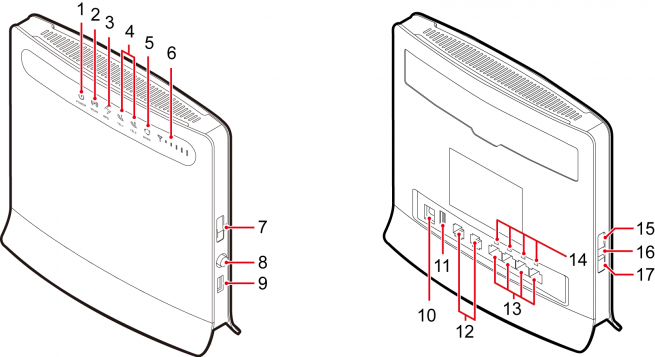 Huawei B593 4G LTE CPE Router is manufactured by Huawei modem and router, which also supports the 4G network . LTE CPE B593 Router full named HUAWEI B593s-82, is the first LTE TDD wireless broadband router of the world, supports LTE TDD/FDD 800/1800/2300/2600MHz, up to 100Mmbs download speed and access to up to 32 WIFI devices that become an ideal home entertainment and information exchange hub, spupports multi-devices simultaneous high speed access, perfect for SOHO‘s and small businesses with its connectivity options of the world, supports LTE TDD/FDD 800/1800/2300/2600MHz, up to 100Mmbs download speed and access to up to 32 WIFI devices that become an ideal home entertainment and information exchange hub, spupports multi-devices simultaneous high speed access, perfect for SOHO‘s and small businesses with its connectivity options. Manufacturer does not specify the functionality.Requires a software update. Not tested or manufacturer does not report performance. Connect the power cord to the modem and the wall socket. 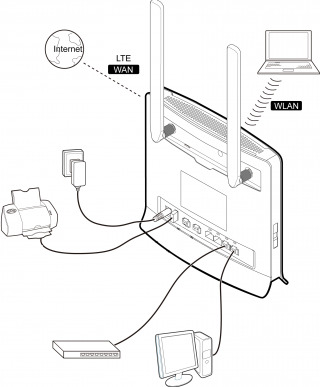 Turn on your computer and any other devices modem LAN and USB ports. Turn on your modem POWER button. Make an indicator that the WLAN is enabled. To activate the WLAN feature on and off by holding the WLAN button for more than 3 seconds. Select your network from the list of wireless networks, the SSID name is the same as the name of your modem and press connect. Enter the network security key. Note: The SSID and network security key can be found on the label on the back of the modem. You can review and change the WLAN security settings for the network-management page under General Settings> WLAN Settings > Security . If the PIN code request is active, log network management page ( http://192.168.1.1 ) and enter the correct PIN code in the field provided. MODE Blue This light is a constant blue, when the modem is connected to the 4G network, but no data is transferred. The indicator light flashes blue when data is being transferred. MODE Green This indicator light is constantly green when the modem is connected to a 3G network, but no data is transferred. The indicator light flashes green when data is being transferred. MODE Orange This light is constantly orange when the modem is connected to a 2G network, but no data is transferred. The indicator light flashes orange when data is being transferred. MODE White This light will flash white when the modem to connect to the wireless network. MODE Red This light is constantly red when the modem can not connect to a wireless network or modem is not a wireless network. MODE Mulberry This light is on when the SIM card is not recognized, or PIN has not been or PIN authentication fails. WLAN On WLAN function is enabled. LAN1-LAN4 On This light is on when the computer or other device is connected to the LAN port. SIGNAL On More bars are lit, the stronger the wireless signal. You can land the management page to check and change the Internet and security settings. Make sure that your flash drive and a computer or device the connection is established correctly. If the PIN code request is active, asking the network management side of it. The default PIN is 0000. On this page to learn how to Huawei B593 modem network management page, check your Internet settings and change the network settings. 1 Make sure that the modem and the computer, and the connection is established correctly. 3 Enter the password in the appropriate field. Password, you can find the label on the back of the modem. actually, there is no software to activate the external antenna for B593, you just need plug the external antenna to the two ports, it would work normally. hoe to connect pc through lan ??? I don’t have the configuration for external antenna; I read it’s because I don’t have the right software even though it says I have the latest. Where can I get the software upgrade to activate the external antennas? 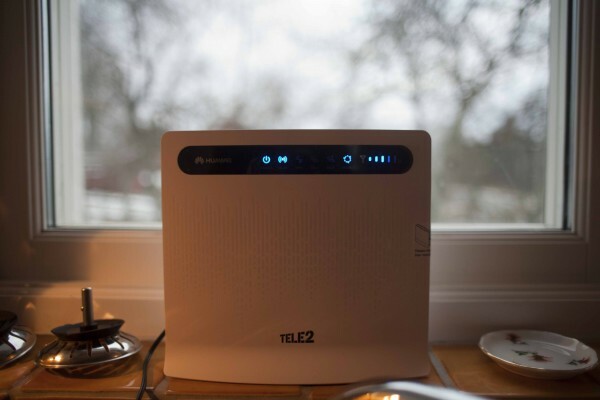 I personally Believe posting, “HUAWEI B593 4G LTE CPE Industrial Wireless Router Specs, Features and Settings | 4G LTE Mobile Broadband” Custom Window Treatments was correctly written! Can we connect External Hard Disk/USB Flash Drive via USB-Port for sharing, as we can share printer through USB-Port? The USB port in HUAWEI B593 is just for USB Memory flash, users connected to B593 could share the files in the USB. b593 also support printer. Are the external antenna ports to increase wifi range or are they for lte reception? the external antenna is to increase LTE reception, not for extend the WiFi range. thank you. they are for LTE reception. you need to set the gmail website to white page, all the other website would be filtered. Hi, want to create private cloud using a WD My Book Live Hard Drive. Does the B593 accommodate this ? HUAWEI B593 could do this, there is a USB interface in B593 for host sharing. i forgot my password can i reset it? yes, you can, there is reset button on the device, you can follow the user manual to reset the B593 and then the password would be set as default. the external antenna of the won’t work,,eventhough they say that it automatically detects the external antenna upon connecting it.the truth is, it doesn’t switch automatically. so what is the point in buying exteRnal antenna? A problem has occurred in the communication between your router and the network. Details:This ESM cause is used by the network to indicate that the requested service was rejected due to an error situation in the network. This error description can also be saved as a text file. That would enable you to send it to the customer supporter via email. hi i have huawai b2000,i installed FMC in to my windows 7 laptop.but the software does not detect my router what should i do anyone help me please. HI,i want to update my b593 there is a software update from my mobile company,but in the pdf file they say i should connect an ethernet cable that came with the router to install the update,but my laptop does not have an ethernet port,can i update it wirelessly?thanks in advance. As we know, you’d better to update via the Ethernet cable. Can we use this router for other broadband services as a normal wifi router like Spectranet..if yes how?? Hello, Is it possible to restrict streaming on this router? I suppose you didn’t configure the settings for network connection. I know this was asked a few times. I connected my WD External Drive for host sharing but it doesn’t seem to read the drive. I tried different brands and different hard drives but to no avail. Is there a setting for the usb port to be activated or something? Thank you. i’m not quite sure whether B593 is compatible with WD external Drive. Can you please help me regarding MAC Address filtering and IP Filtering for Huawei 4G B593? I already whitelist all my friends in their MAC Address but the things is, i tried to connect my other laptop which is not included in the MAC Whitelist and yet i can still connect to the internet. It’s better to provide a screen shot of your setting. After setting, it’s better to re-start the router. it is better if you could provide your sample setup? how much this huawei b593 cost? and where can buy the modem tnx..
avialability of this sir here in the philippines? availability of this sir here in the philippines?